LIMA, Peru, Sept. 16, 2018 – The U.S. women won the team title at the at the Senior Pan American Championships in Lima Peru, at the Polideportivo N° 1. 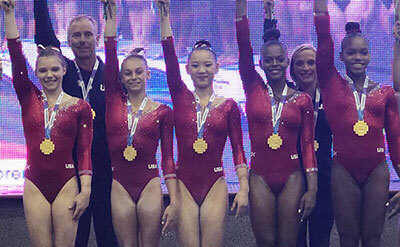 The U.S. women tallied a 169.467 to take the gold with a 5.501-point margin. Brazil was second (163.966), and Mexico finished third (155.299). The U.S. women also won 10 medals. The U.S. women’s team event scores were: vault, 44.099; uneven bars, 42.334; balance beam, 41.767; and floor exercise, 41.267. The members of the U.S. Team were: Jade Carey of Phoenix, Ariz./Arizona Sunrays; Kara Eaker of Grain Valley, Missouri/ Great American Gymnastics Express; Shilese Jones of Westerville, Ohio/Future Gymnastics Academy; Grace McCallum of Isanti, Minn./Twin City Twisters; and Trinity Thomas of York, Pennsylvania/Prestige Gymnastics. Their individual event scores are listed below. Earlier in the championships, the U.S. women also won 10 individual medals: McCallum, all-around and uneven bars gold, and vault and beam bronze; Carey, vault and floor exercise gold; Thomas, all-around and uneven bars silver; and Eaker, balance beam gold and floor exercise silver. They also qualified the USA for the 2019 Pan American Games.